I open my eyes and I’m in a mysterious, candle lit room with a man sitting across the table, staring back at me with his face mostly covered. He is The Dealer. On the table before me rests a set of dice, cards, and a small figure. After a few words from my friend across the table I get thrown into this card game. Seems simple enough. I go along my way collecting gold, food, and equipment. Suddenly, the first battle occurs and I must choose a side, also choose whether I live or die. I decide, then all of a sudden, it’s not just a card game anymore. 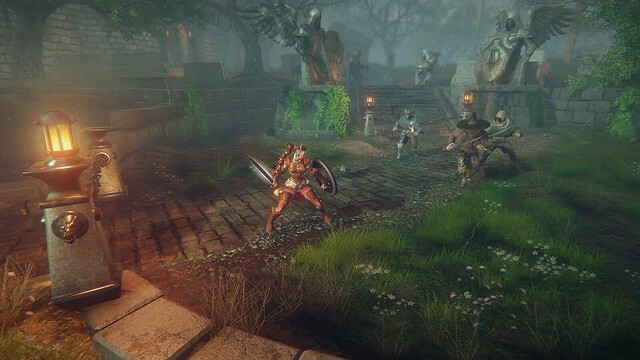 Hand of Fate 2, an action RPG game developed and published by Defiant Development, combines card game and character game play very well and seamlessly, while reminding me of my Dungeons and Dragons days. I was never bored during my time playing and at every card flip and dice roll there was something new for me to make a decision on. Should I help this damsel in distress? Fight with farmers or with the thieves? Stand my ground or run away? However, no matter what path you choose to take, your fate is decided for you. You will always end up at the same event but how prepared you are is up to you and the choices you make along the way. I made a lot of particularly bad ones and was left at the final event for some of the challenges with very little health. It’s safe to say I died very quickly and had to start over again, to hopefully make better decisions. It’s not just what decisions you make but also chance and fighting skill. Some of the cards require you to roll dice to decide what the outcome will be. 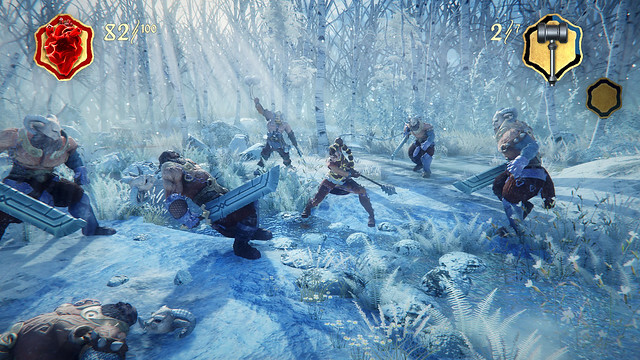 When it comes time to fight, you have to be quick with your fingers and be careful to take as little damage as possible, as is the case with most games, so you don’t end up dead later. The battles were set up very simply but still gave an increasing challenge as I progressed through the game, making me think carefully and pay attention to what my enemies were doing before making my next move. The sound effects during the battles were also well done, from the clash of my enemy’s sword against my shield to the sound of my sword against their armor. Every magic spell I encountered along my way had a unique sound and aided in my immersion. I especially want to commend Anthony Skordi for his phenomenal voice acting as The Dealer. He was able to give him the perfect voice that I feel truly fit the character he portrayed and gave you another reason to feel slightly uncomfortable trapped in that endless card game. One thing I will say is that there are no save points in Hand of Fate 2, but each challenge does not take very long to go through even if you don’t succeed on the first try. When you die, you start all over again at the beginning of the challenge. This isn’t necessarily a bad thing, even if a little frustrating, if you want to make a different decision to hopefully change the outcome or how well prepared you are for the final stage. 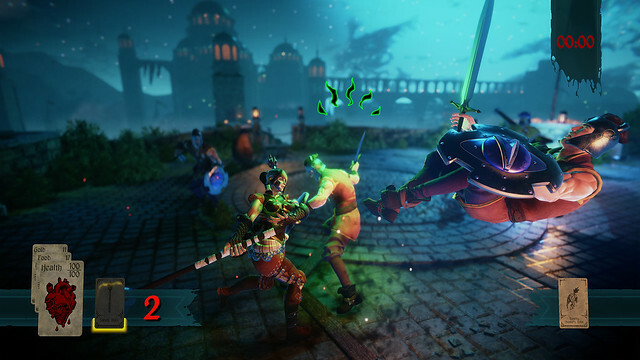 With the different types of gameplay that Hand of Fate 2 has to offer I very much enjoyed my time playing and it kept my attention every step of the way. The graphics were surprisingly realistic while still giving a small touch of a cartoonish feel. I truly enjoyed the detail in the different weapons I obtained along my way. The scenery also switched between the dark mysterious room and the bright outside zones I was in very well and made me feel like I was being sucked into the card game I was forced to play. Now I myself have not played the first edition of Hand of Fate. After reading different reviews and what other people had to say about Hand of Fate 2, I feel confident in saying that Defiant Development took a good game and made it so much better. 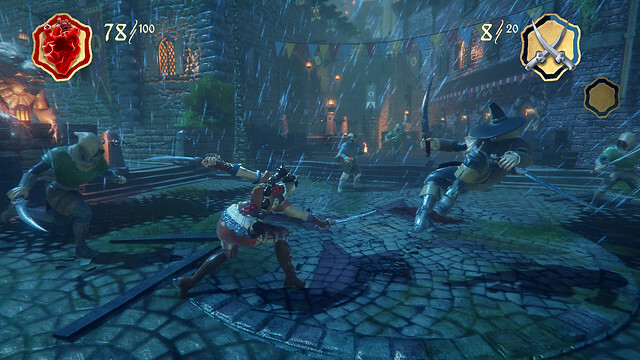 Hand of Fate 2 is a great game that combines different play styles to tell a story and decide your fate for you. It was fun and refreshing to play and made me think a lot harder about my next action that I would take. The smaller indie games and developers are not given enough credit and this game is an amazing example why they need more attention. I highly recommend Hand of Fate 2 to anyone who is looking for a different take on the dungeon crawler, or even a different game to occupy their time, that will keep their attention and keep them guessing. Rebecca is an avid video game lover and writer. I enjoy playing any and all video games as long as I’m having fun doing it. Anything from the simplist free mobile game to the more complicated and sometimes frustrating PC or console games. Follow me on Twitter or Twitch for more fun!